Photo Galleries COWES WEEK 2016 COWES ALZHEIMER CAFE IS GIVEN Â£500 ACTIVITIES SUPPORTED 2015/16 What Is Rotary? Visit from La Rochelle Rotary Club May 2016 CHRISTMAS CONCERT 2015 COMMUNITY HANDOVER 2015 FUND RAISING Presentation to Cowes Sailability 2015 INTERNATIONAL YOUTH SPEAKS 2016 INTERACTORS SUPPORT IW FOODBANK LIKE TO JOIN US? Medina Theatre, Newport on Sunday 1st February 2015 was the venue for this outstanding and professional Band to say a 'Thank You' to the Cowes Rotary Club. Cowes Rotary has supported the Band for many years, and the Band wanted to return the compliment, so the concert was in aid of the Rotary Trust Fund, which helps many causes for young people on the Island, and raised £800. An audience of over 150 came along to support the concert, a great turnout for a freezing February day. Both Junior & Senior Bands, under the Directorship of Martin Stroud and compere Michael Arnell, played a huge variety of music from 'Colonel Bogey' to 'Les Miserables'. 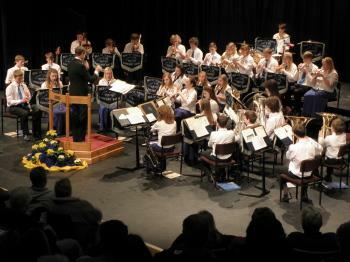 The second half of the concert opened with a 'Big Band' feature performing such pieces as 'Take The A Train' and 'Satin Doll' with several members playing alternative instruments. Band Oboist Polly Green sang a beautiful and professional rendition of 'The Wind Beneath My Wings'. The finale of Trevor Sharpe's 'Fanfare and Soliloquy', performed by both highly talented Senior and Junior bands together, was a fitting end to a wonderful concert.